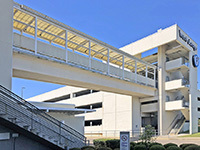 Renovation to the pedestrian bridge connecting the West Garage to the third floor of the Women’s Center is scheduled to begin on April 15. The renovations will necessitate the temporary closing of the pedestrian bridge, as well as a portion of the street below it. The renovation is planned to be completed by mid-July. Parking on all four levels of the West Garage will remain open during the duration of the renovation project. However, it will affect where patients and visitors can enter our facility. Take West Garage Elevator A to the first level of the parking garage. Follow the covered walkway near the Elevator A exit from the first level of the West Garage. Enter Southeast Health through the Heart and Vascular Center. Please use Elevator K inside the building to enter the Women’s Center. There will be appropriate signage to direct you to the main hospital. Take West Garage Elevator B to the first level of the parking garage. The Emergency Department will be to your left once you reach the ground level. Outpatient will be to your right once you reach the ground level. You will not be able to directly access the Emergency Department or Outpatient Center from the Hwy 84 / East Main Street entrance. To drop off patients or visitors at the Emergency Department or Outpatient, you must enter from Fairview Avenue, which runs north and south from the Ross Clark Circle to Haven Drive.